Other than the Thrawn Trilogy books, I don’t think I have ever consumed any other piece of fiction that featured Mara Jade, but I thought the whole Emperor’s Hand idea to be fairly plausible within the Star Wars Universe, although I did feel that her eventual marriage to Luke Skywalker in the Expanded Universe was taking things a little too far. Shortly after Disney’s acquisition of Lucasfilm, they announced that the Expanded Universe stories set after Episode VI were no longer to be considered canon, and I was OK with that, as most of the books published in the recent years were little more than glorified fan-fiction, in my humble opinion. 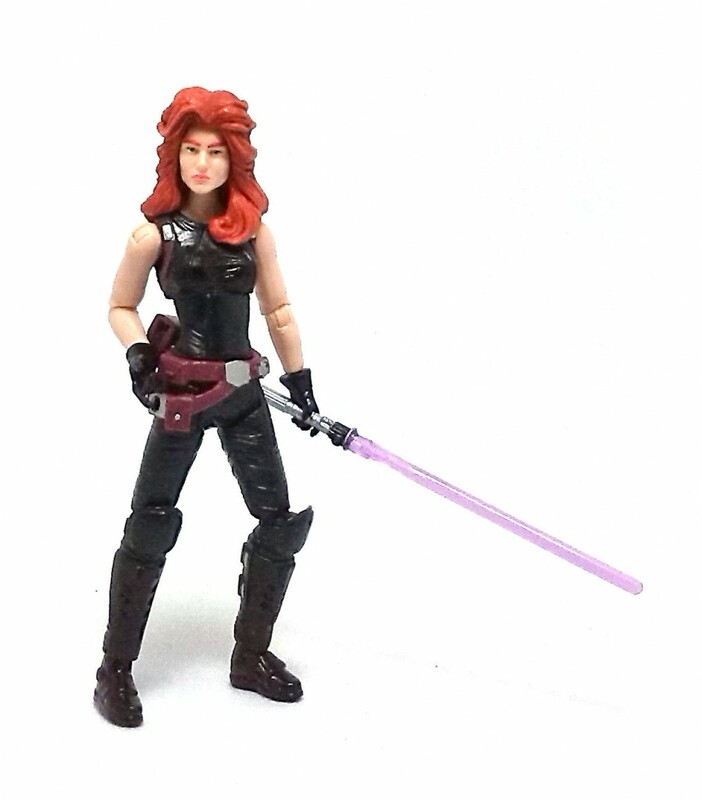 With that in mind, I found it surprising that Hasbro managed to squeeze yet another version of Mara Jade for their 3.75 inch Black Series Collection. To be fair, Mara’s character must have been slated for production (as a result of a fan poll) months if not years prior to the Disney deal, and even though this is not the exact version of her that was voted by the fans, it is still a pretty definitive update for her original costume. 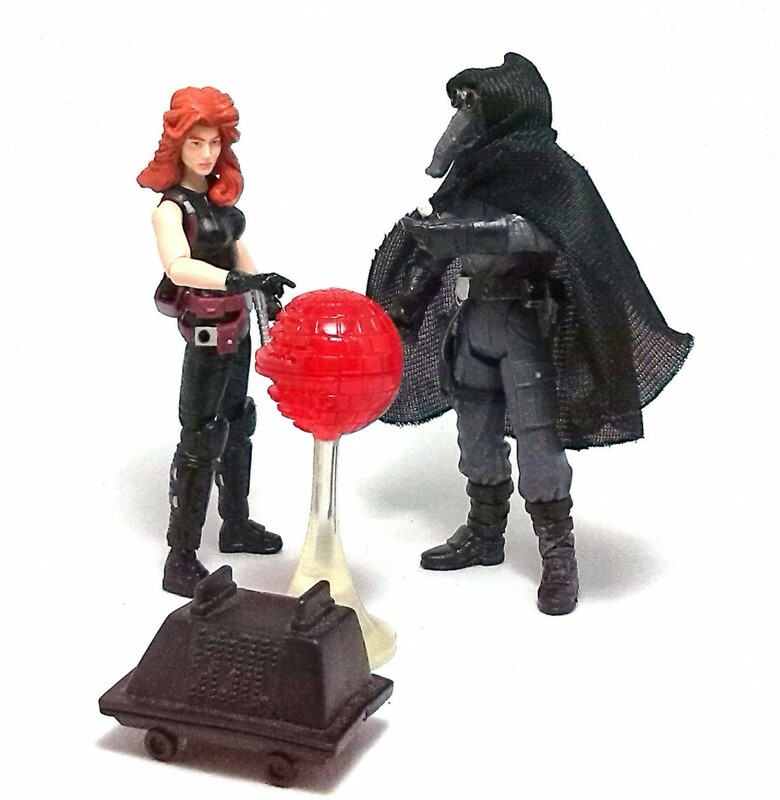 Unfortunately, at this point in time Hasbro was experiencing some changes at the toy factories in China and as a result, the first few batches of Mara figures display some design and production issues. To be fair, the design and sculpting of Mara, from the neck down is excellent. Her uniform is nicely detailed and her overall body proportions are very good. I would even say that her face sculpt is also fairly pretty. Her hair, however, is pretty hideous. She has a rubber “wig” piece that was sculpted way too high and shaped oddly, and to add insult to injury, the first few batches of figures shipping from the factories had the hairpiece glued way too high over her face, giving Mara a rather freakish appearance. 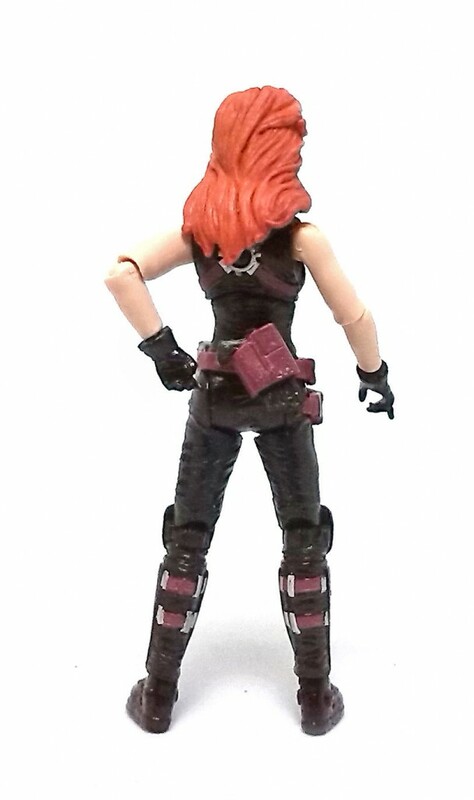 Fortunately, subsequent batches of this figure had the wig properly aligned, which does improve her overall appearance even if it is still the same horrid hair sculpt. 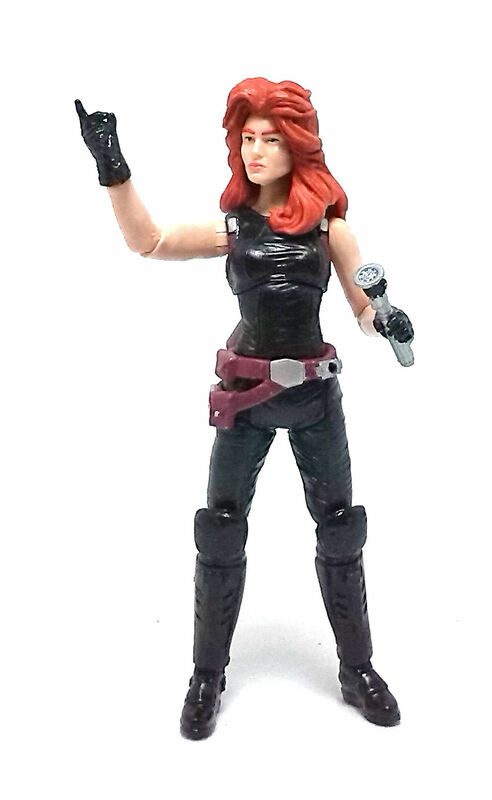 All of the articulation points work very well, and even though Mara has her arms bare, the joints at shoulders and elbows are not too distracting. The coloring in Mara is where we find some more causes to complain about. Again, the paint applications on her outfit are good and neat, with glossy black painted over black plastic and some small touches of color in brown and silver for her leatherwear. The color of plastic used for her bare arms and face is way too pale, giving her a waxy, unhealthy look that is emphasized by the orange used for her eyebrows and hair. Also, even though they are neatly painted, her eyes are very small, which gives her a squinting, un-friendly expression. 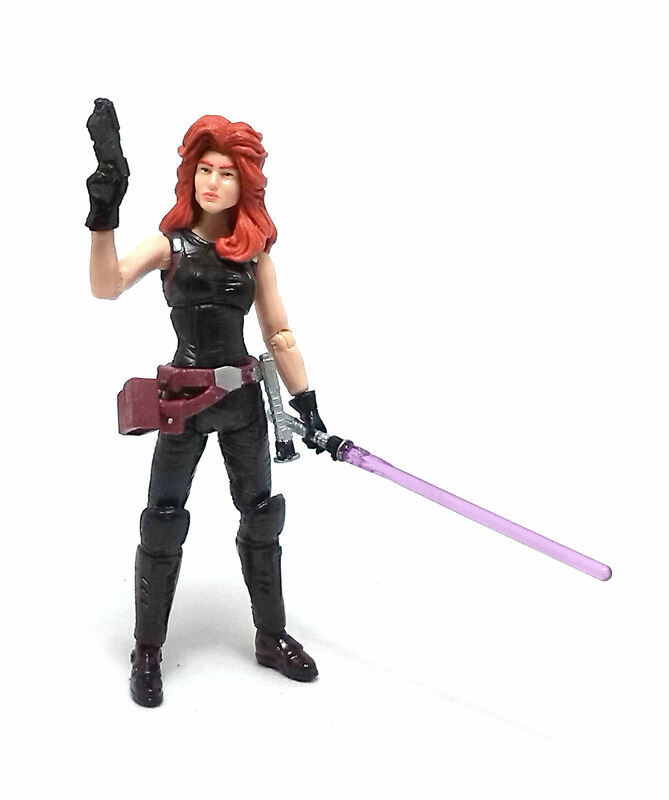 Mara comes equipped with a violet lightsaber, a deactivated lightsaber hilt, a small blaster pistol and a holster for it that can be placed either at her side or attached to the back of her belt using a couple of pegholes sculpted into the accessory. 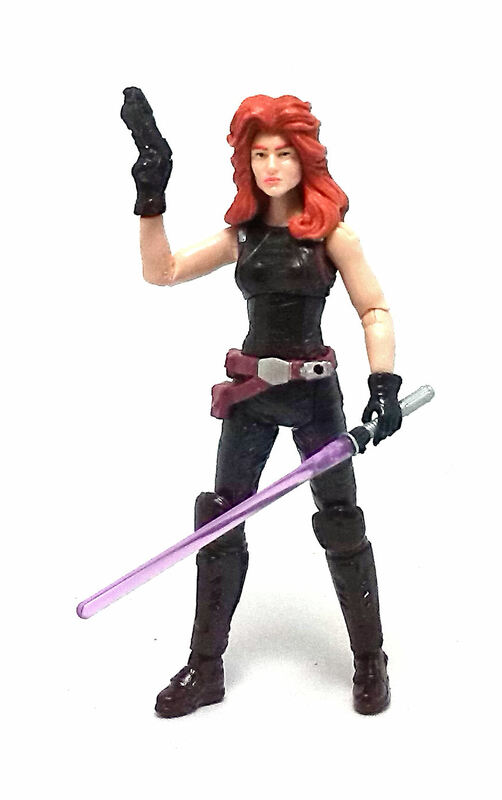 With all the post-Return of the Jedi stories excised from the Star Wars continuity, it is a pretty safe bet that this is the last Mara Jade action figure we will ever see, so it is rather sad that this last Mara is not quite as good as it could have been.